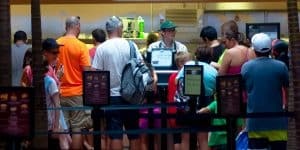 A Walt Disney World vacation doesn’t have to be all go, go, go all the time. Kids need time for some unstructured playtime during all that scheduled fun. Thanks to their fantastic play spaces at the parks and resorts, kids can have time to run, play and be free. 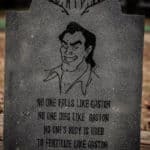 But Disney takes it one step further. 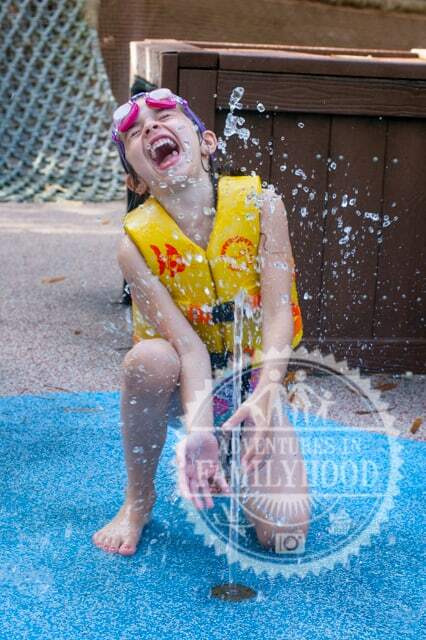 Not only do they provide spaces for play, they also provide spaces for wet, water play! These splash pads, fountains and sprinklers give kids a fun place to cool off while giving parents some well deserved downtime. Plenty of water play can be found without even setting foot inside the water parks. 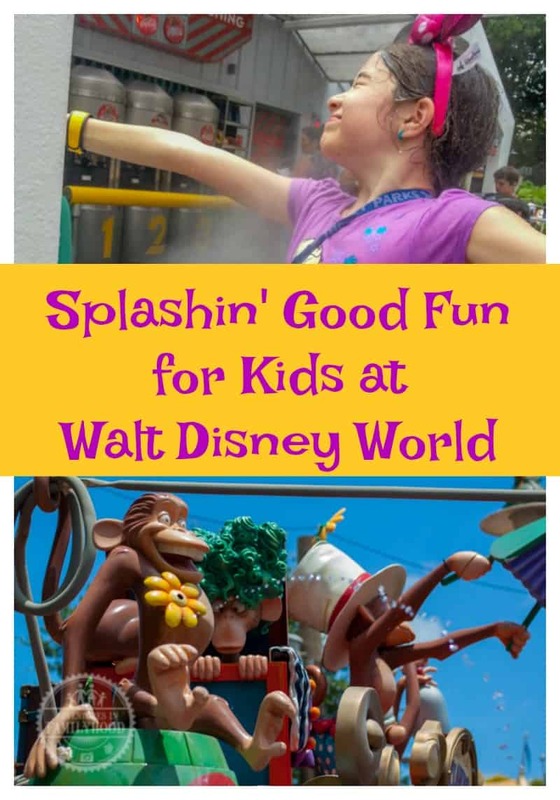 Almost all theme parks, Disney Springs and the Resorts have splash or water play areas for kids. 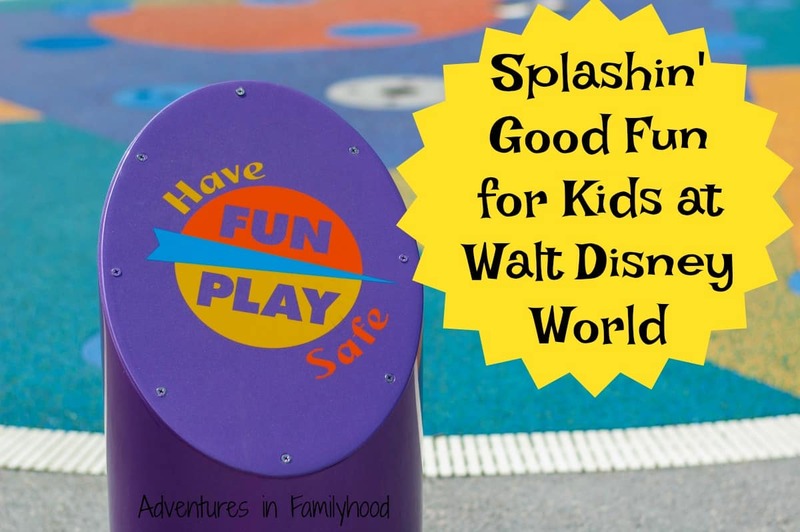 Ranging from a simple fountain to a huge squirting train, these areas provide splashing good fun. 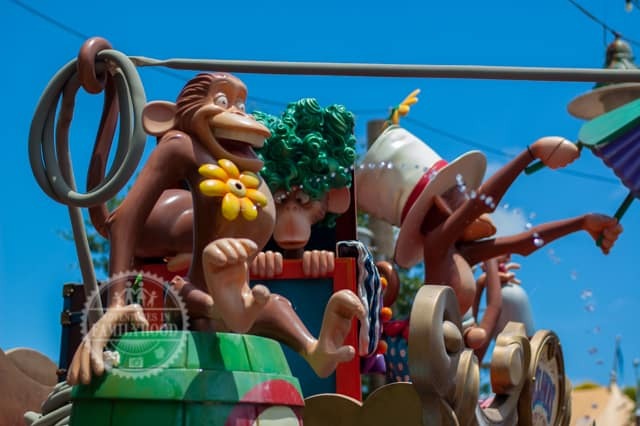 Pro Tip: If you’re visiting Walt Disney World during its hottest times, you might want to stop for some water fun in the parks. Pack along a swim suit or an extra set of clothes for your kids. 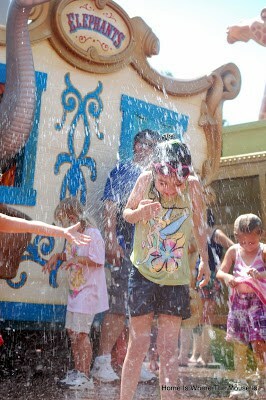 Head to the back of Fantasyland to find the best in-park water play area. 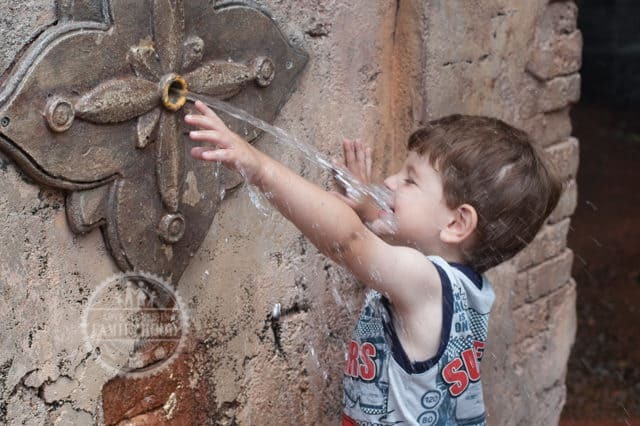 Inspired by the circus train from Dumbo, Casey Jr’s Splash and Soak Station includes fun interactive water features. Watch out for the crazy animals who may unexpectedly spray water. 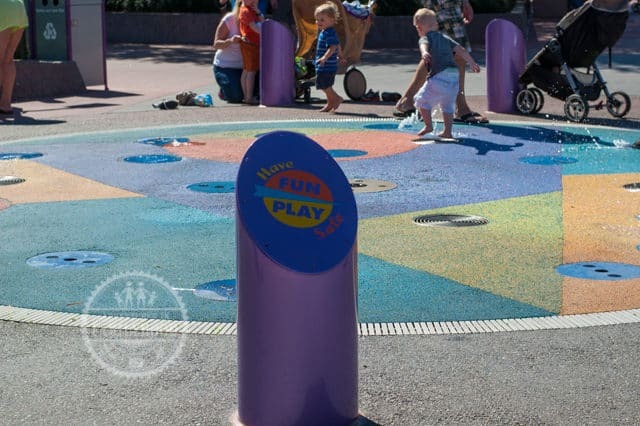 There are a few areas for water play in Epcot. 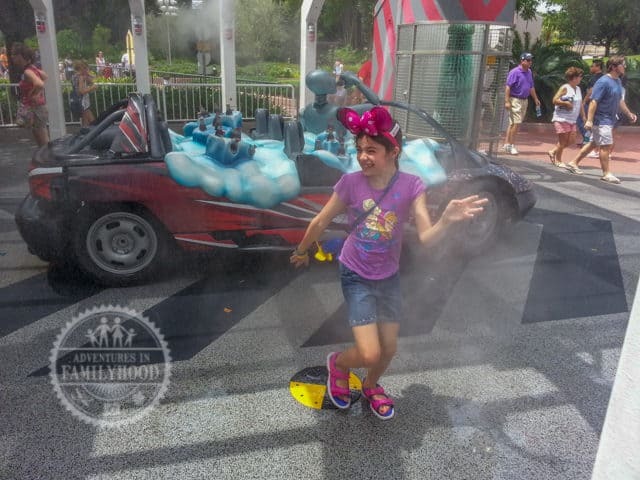 The first is a splash pad located between Mission Space and Test Track. Nearby, kids can get wet from the sprayers at Cool Wash quick service stand. Over by Imagination, there are some pretty cool jumping water fountains. Try to catch the jumping streams and you’re bound to get wet. 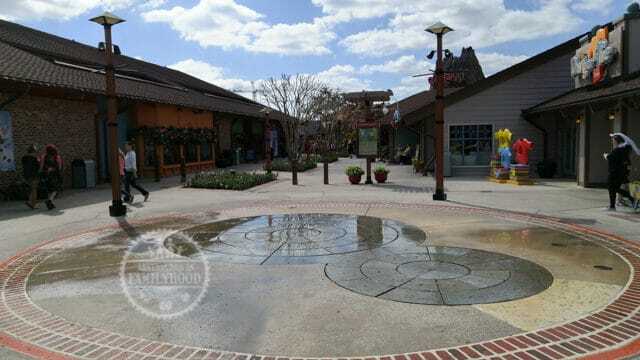 Lastly, there’s a splash pad on the walkway between Future World and World Showcase. 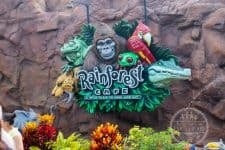 Just outside the wettest ride in the park, Kali River Rapids, there are fountains that the little ones to enjoy. It’t not an official splash area, but kids (ours especially) have been known to walk though it on purpose just to get wet. At the Marketplace entrance by The Disney Days of Christmas and at the entrance by Once Upon a Toy, there are areas of playful fountains. Kids will have a blast running through the unpredictable streams of water. 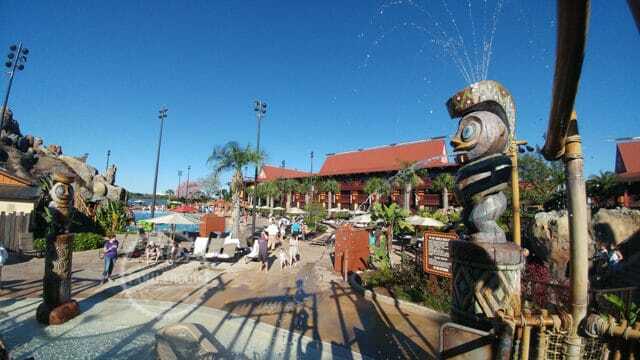 As each Resort hotel’s pool area has been refurbished, new splash and sprinkler areas have been added. These areas have fun waterslides, interactive water play and plenty of opportunities for splashing around. 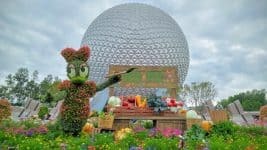 Planning your next Walt Disney World Vacation? 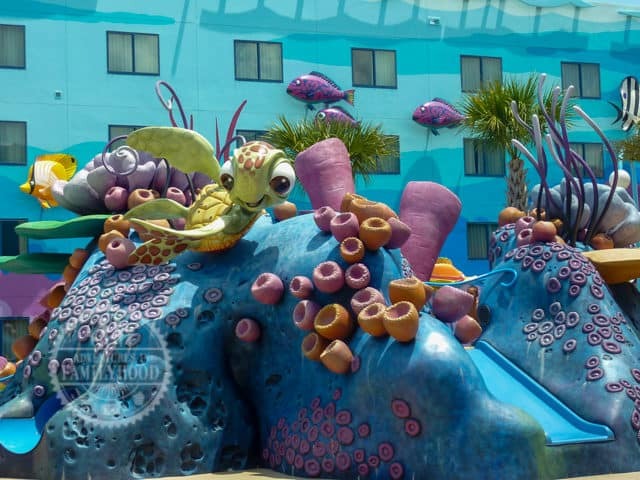 Visit our Walt Disney World Tips board on Pinterest. I love splash pads. I wish Disneyland had one (DCA does but Disneyland doesn’t really, just a giant ball in water thing). Your kids are like my oldest, love to get soaked.